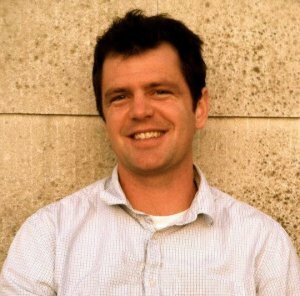 I'd like to introduce you to Conor Flaherty – a guy with a wealth of experience in flipping apartment buildings, single-family houses. He's an expert in an area that I've always wanted to learn more about – so I've asked him to give us the low down on how this all works. 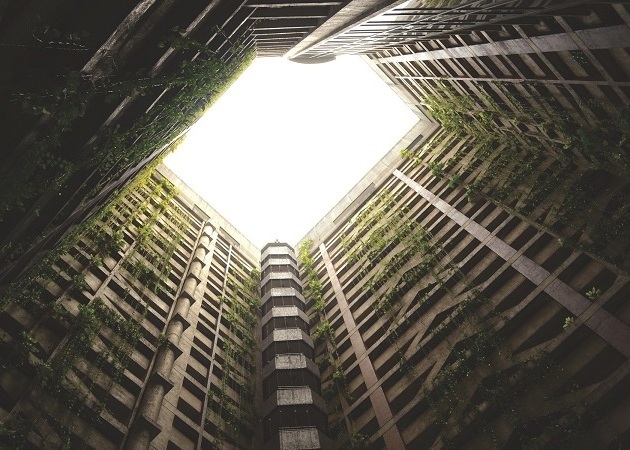 What's so great about dealing with large apartment buildings? I think it's the fact that in many ways, it's similar to dealing with a small property (like a single family house), but the numbers and profit potential is compounded, like a regular rental property on steroids. I've asked Conor to give us a detailed overview of how these opportunities are found, financed, bought and sold. Take it away Conor! 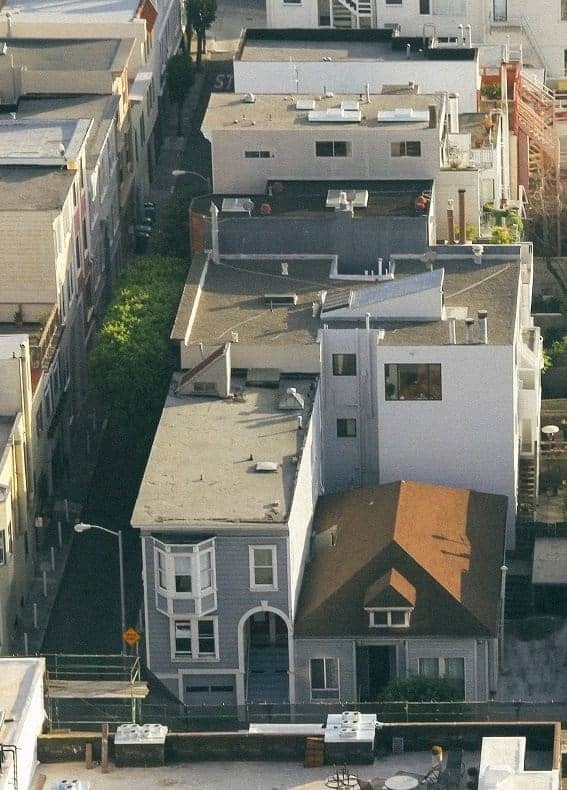 Flipping an apartment building is a different animal than flipping a single-family home. The main difference stems from the way these buildings are valued. Most single-family homes are valued with the comparable (or “comp”) method. This method takes similar homes that have recently sold and uses them to establish a value based on their similarity to the subject property. In other words, if the house next door sold for $100 and is exactly the same as yours, then your house should also theoretically sell for $100. Apartment complexes, on the other hand, are quite different because their sale price is usually based on a “cap rate” basis. A cap rate (aka – Capitalization Rate) is calculated by taking the property's Net Operating Income (NOI) and dividing it by the purchase price of the property. To put it plainly, a cap rate is the annual return on the property before debt service. When you are flipping an apartment building, you need to keep your primary focus on the NOI of the subject property. Now, this is not to say that the property’s aesthetics and location aren't important (because they can make a big difference). 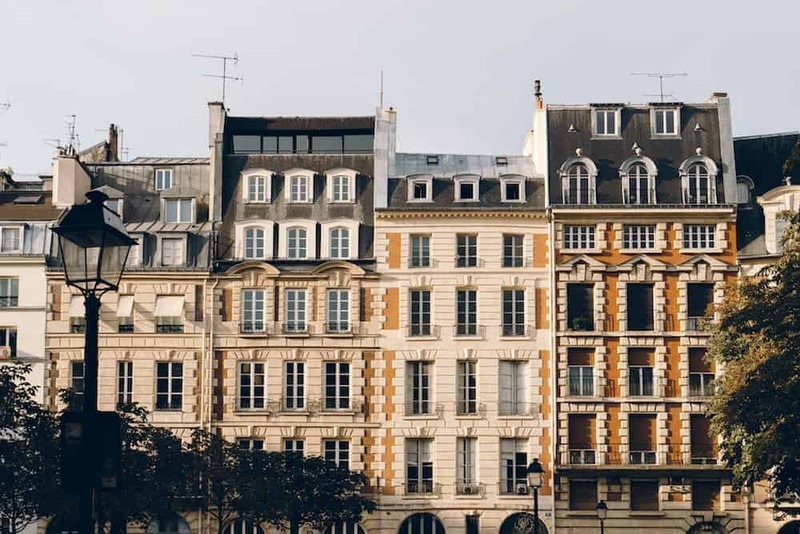 For example – there could be two properties that produce the same NOI, but if one is in a good area and looks great and the other is in a war zone and looks decrepit – the nicer building is likely to sell for a far lower cap rate than the one in the war zone. Thus, a property's cap rate can also be an indicator of risk. The higher the cap rate, the higher the risk. An ugly property in a terrible neighborhood would need to offer a much higher yield because it presents much more risk than the nice one. As a general rule, you want to sell for the lowest cap rate possible and buy for the highest cap rate possible. 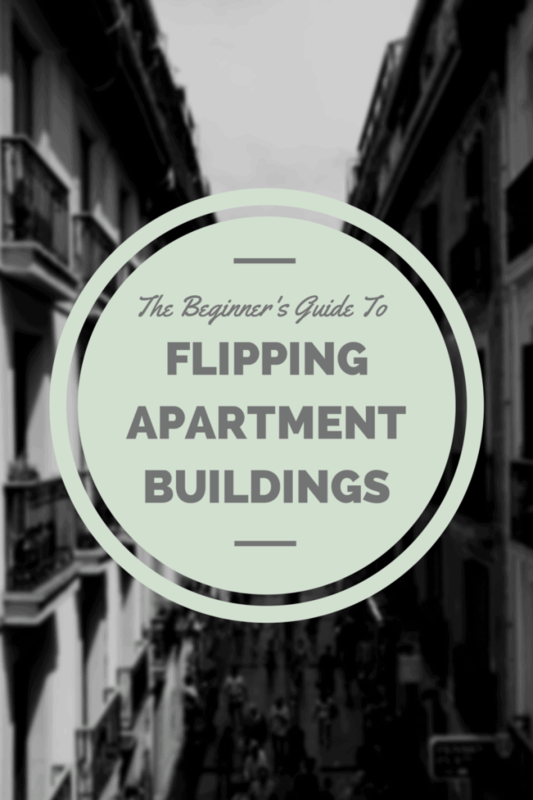 In this post, I’m going to outline the process I use to flip, or re-position, an apartment building. Finding a good deal is always hard whether it be a single-family house, a condo, an apartment building, or even a new car. The key is to understand the market you are buying in so you can decipher what is a good deal and what isn't. The best way to do this is to find a good real estate agent or broker. The way I do it is to go on loopnet.com and see which agent has the most listings in the market that I like. Think about it – sellers are probably using this person for a reason! What is inventory like right now? What kind of returns are people getting? Who is buying apartment buildings? Who is selling? Are you optimistic about the market? Why? How long have you been doing deals? 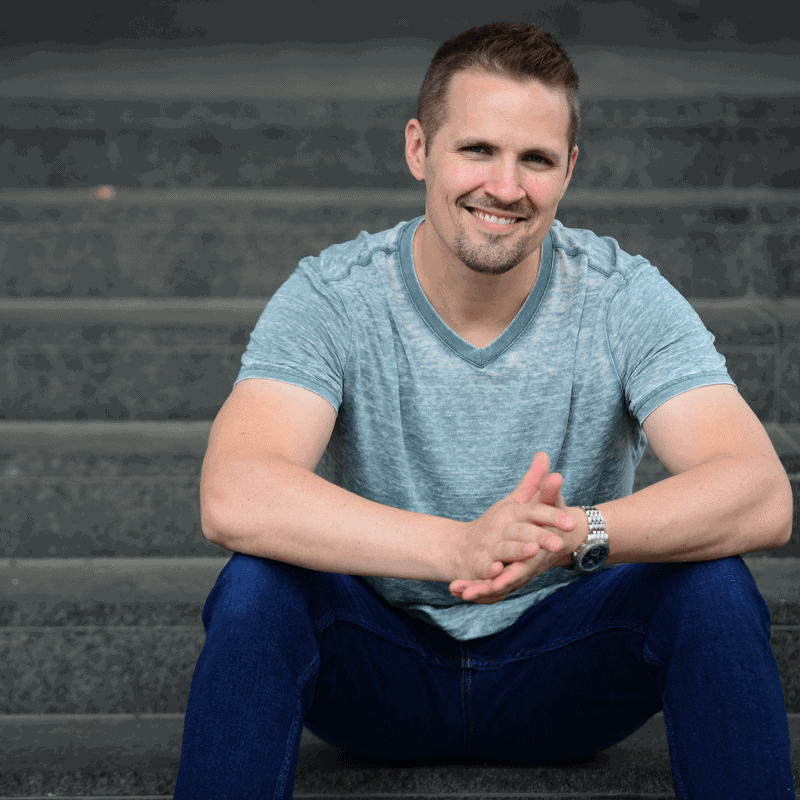 Have you worked with clients like me before? You should come up with your own questions to ask as well. The other thing that a good agent will have is access to market reports. I really like REIS reports because they go into good detail about sub-markets, but it is likely that the company the broker works for will also have reports. Ask for as much research as they will send you, and then read and think about the reports. More apartment deals are sold off-market than single-family homes and there are a few reasons for this. First, apartment owners generally don’t want to spook their tenants by telling them they're going to sell. Putting up a big fat “For Sale” sign in front of a complex will usually cause some tenant unrest, lack of payment, or simply motivate people to move. Second, the apartment world is pretty small and sometimes owners don’t want other people to know that they're selling at all. Doing a deal off-market provides far more anonymity than listing it for sale. Lastly, many apartment deals are purchased by buyers who solicit sellers before the complex even goes on the market. Your goal should be to buy an apartment building that is off-market because you are likely to get a better deal. This isn’t to say that you can’t get a good deal on a building that is listed, but it’s just less likely. Flipping an apartment building is NOT a long-term, buy and hold strategy. You need to understand exactly how you're going to increase the value in the property. Remember, it always comes back to rents, NOI, and ultimately the cap rate. Once your broker sends you over a “deal”, you need to do your due diligence and make sure that it actually is a deal. The first thing you want to ask for is the “rent-roll” for the property. A rent-roll is a complete list of the units, tenant names, monthly rents and it usually includes the terms of each lease as well. The rent-roll may also have the size of the unit in square feet and also the number of bedrooms and bathrooms in each unit. This is going to be a very important piece of information for your analysis of the property. The next step is to determine what the rents rates are in this market (or what you think you'll be able to rent each unit for). This can be more of an art than science and it definitely requires a lot of effort. To start – you can check out a site like padmapper.com and see what kinds of rental listings are available near your property. You can also call around and ask some property managers what they think your units would rent for. Then you need to get out and physically see the rental comps. There are a lot of factors that can cause disparities in rental comps (age of the property, road noise, property management, etc.) and in the end, the only way to get a good sense for all those factors is to physically be there. Most likely, you will need to be confident that you can boost rents in order to flip the property. The good thing about apartment buildings is that a small rent bump can have a big impact on value. Let’s assume you are buying a 20 unit apartment building where rents are currently $500 per unit. Assume that you do your research and find that market rents are $550 for the same type of unit at the complex across the street. You drive to the other complex and see that your apartment complex is in a better location and even looks a bit nicer – the rents are just low because the current owner is elderly and doesn't want to go through the hassle of raising rents. Remember – a cap rate is calculated by dividing the property's NOI by the purchase price. It is basic algebra to calculate the unknown variable. Once you figure out that your property has the potential to be flipped (i.e. – once you know you can raise the rents), your next step is to figure out how much money (if anything) it will cost to get you there (hint: this really depends on the condition of the property you're buying). I won’t go into too much detail about the renovation process, but you'll want to make sure you're getting a contractor to walk through the property with you so he can give you firm bids for the cost of renovating each unit. This is a crucial step – one that needs to be done prior to closing on the property. Some investors create massive, complex models that no one can understand – and what's the point in that? At the same time, you must make sure to include every relevant expense. This is only the first two months of projections and I usually take it out to show the first two full years. There is a “0” when the apartment will be vacant because the current lease will be up and I will spend that month turning it and finding a new tenant. Beyond two years seems too much like a guess to me. 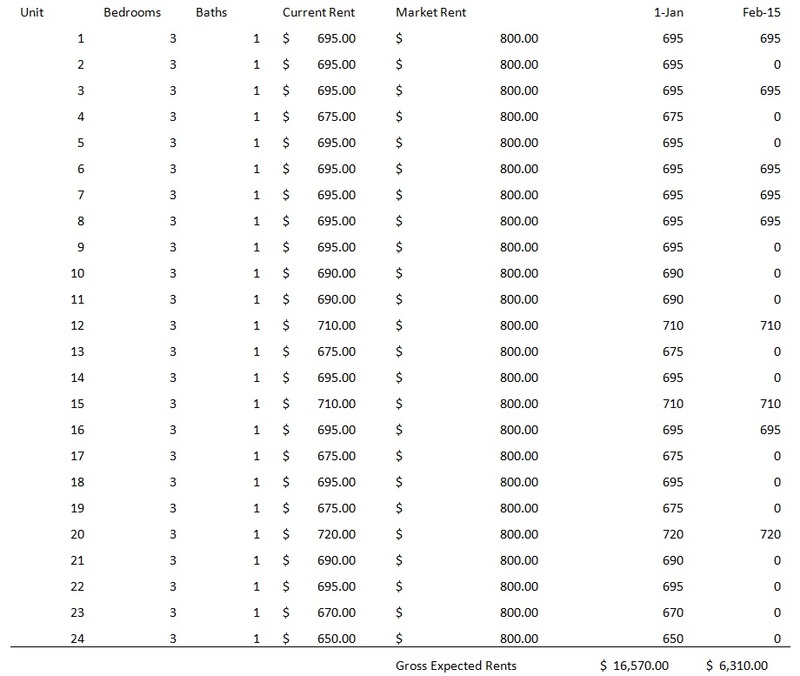 As I mentioned, REIS has great market reports that will give rent projections for about 10 years in the future. If an investor asks for ten-year projections, I would use an REIS report as the basis for rent growth and vacancy. The Gross Expected Rent should come from the previous sheet. 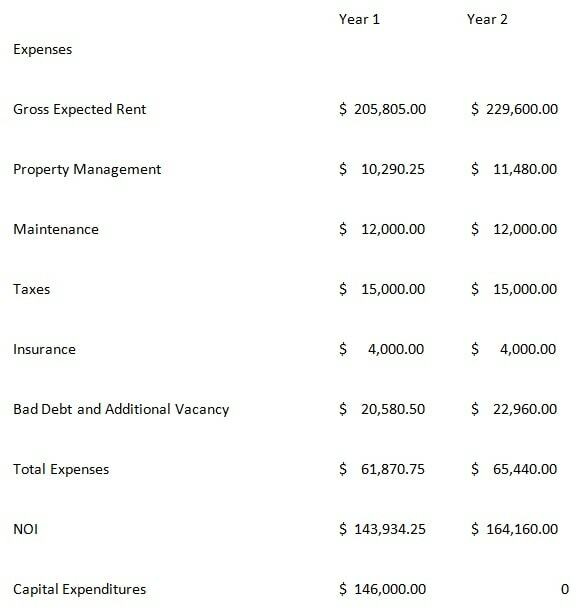 Property Management is usually a percentage of the Gross Expected Rent, in this example, it is 5%. To get a firm handle on this number, you'll need to call around and find a property manager that you like. The goal should be for them charge a fixed percentage, without any leasing fees or anything like that. Maintenance can be very difficult to project. I usually like to assume $500 per unit, and I think that this is a safe assumption for most places if you are planning on going in and fixing up every unit (like I am in this example). Taxes should be determined by calling the county assessor’s office. Every place is different and you may need to do some digging to find out how much you'll actually have to pay. Your title company can help you nail down this number too. Insurance just requires that you get a quote from State Farm or any other insurance company that insures the commercial property. Bad Debt and Additional Vacancy is another important line item. If your goal is to buy this apartment building and hold onto it for ten years, then this line item shouldn't be much higher than the market level. However, if your goal is to flip the property, then you need to make sure you allocate enough money here. Again, depending on the location, getting tenants out of your property can be very difficult and very expensive (e.g. – in California, it took me over a year to get a squatter out of one of my rental homes that he broke into). For this reason, I would only recommend that you flip properties in municipalities that are landlord friendly (or plan on getting a very good eviction attorney). The last line item on the list is Capital Expenditures. This is a number that should come from your contractor, and you want to make sure you have a comprehensive list of renovation items for him to bid on (for more detail, check out this post on BiggerPockets.com about the renovation process). What do you think will happen to cap rates in two years? Who is buying this kind of apartments right now? What is the trend for apartment buildings in this area? How long to properties stay on the market? This will all factor into the “flip-ability” of your apartment building later on. Decide on a cap rate that you think is conservative, and then divide the projected NOI by the cap rate to get the potential future value of your property. Make sure to back off broker and escrow fees. If there is enough profit in there for you, then you should do the deal. After you've underwritten the property and decided that it’s a good potential buy for you, the next step is to make an offer and get it under contract. You want to give yourself as much time for due diligence as possible. For a deal that is between $1 million and $2 million dollars, I like to allow 60 days for inspections and then close 30 days after that – a 90 day total escrow period. For a deal that is over $2 million, I usually ask for an additional 30 days for inspections, but I'm prepared to hustle and get everything done in 60 if the seller wants. It is important to get thorough inspections while you are in escrow. Yes, you should have already had your contractor walk through the building, but inspectors are trained and paid to find things that you and the contractor are not. It might seem painful to pay a couple thousand dollars for inspections, but it's completely worth it. If inspections come up with unforeseen issues, you can always go back to the seller and ask for a credit to offset these additional costs. For any additional renovation items that come up, make sure to have your contractor give you a bid for it prior to closing. This way you will have a hard number for all of your capital expenditures. Arguably, the most important piece that comes to fruition during the escrow period is the loan. I'm always a big fan of shopping around to as many loan officers as possible in an attempt to get the best rate. I like loans that are fixed for the longest period of time because it gives me leeway. Flipping an apartment building takes time, and the more time you have, the more secure you are in the deal. Yes, you may model out your flip to take about two years, but if you have a fixed rate loan for ten years, then you are in a much better position, in my opinion. When you are comfortable with the property condition and loan, then you can close on the property. Property Management is going to be a crucial aspect of the flipping process. Most importantly, you need your property manager to be on the same page with you when it comes to turning these units and raising rents. Outline your model for them and make sure they agree that your underwritten rent is actually feasible. The structure for most property management agreements is that they will get a fixed portion of the gross income that is generated from the property. This is fine, but understand that if they collect an extra $1,000, it may only get them an extra $50 (even though they'll have to put in a ton of extra work to generate that extra $1,000 of gross rent). In other words, you may need to give the property manager an incentive with a small portion of the upside on the flip. My strategy is to wait until each unit's lease ends before trying to raise the rent. I think it's a bit sketchy to try to raise rents in the middle of a lease agreement and it can also create some legal problems. I have the property manager notify the tenant a month before their lease is up that we are going to raise their rent by some amount. They are welcome to stay if they are willing to pay the new rent, otherwise, they have to move. In my experience, about 75% of the people will stay if the rent increase is reasonable. I will also offer them something nice in exchange for agreeing to the rent increase (like buying a new stove or replacing the carpet). It may seem like an unnecessary expense, but it saves me money in the long run because I would have to renovate their unit anyway. If the tenant decides to move, then I can simply fix up their unit and list it for the new rental amount. Sometimes a tenant will want to stay at the old rate and will get a lawyer involved. You need to make sure that you are legally allowed to raise rents and if you are, then you may still need to hire a lawyer to advise you on the best legal course of action. Evictions are a sad part of the business. The reality is that if you are trying to flip an apartment building, you are going to run into some evictions – it’s just a numbers game. Don’t get emotional about it or take it personally. Look at every decision from an economic perspective. If the tenant needs $500 to move and it gets them out right away, you should probably pay them to get your unit back. Once you have turned the units, it is important to improve the general look of the property and common area. Paint the outside of the complex, do some landscaping, replace the fencing and even add a new swank mailbox. Curb appeal is important for tenants, but also for prospective buyers. The last thing I will say about turning units is that you need to be flexible. It is possible that you underwrote the wrong rent, or maybe the market just changed on you. Don’t freak out and don’t be too hard-headed to make an adjustment. If you can only raise rents $25 per unit instead of $50, then take it. This is another reason why you'll want to get the longest, fixed term loan as possible. If you can afford to make the payments, it's very possible that within the fixed portion of the loan, you'll be able to get the rents you were originally hoping for. Most likely, you'll want to list the property with the same agent who brought you the deal in the first place (this is just good business) but regardless of who your selling agent is, you'll want them to use a proven process when they're selling your building. In other words, don’t just list the property and hope that someone buys it. Have your agent look up who the investors are that have been buying properties in the area and then contact them. Tell your agent to send all these buyers the information package on your complex and tell them that offers are due in a month. The goal is to whip everyone into a frenzy. By using a deadline like a month, you also give the average buyer a chance to see it on market. It is possible that you won’t get any offers that you like within a month’s time. That is fine. There are other good options for you. You can go back to your bank and try to refinance. If your underwriting is correct, it is quite possible that you can take out more money from the property and still hold onto it. Lenders sometimes refer to this as a “cash out”. Heck, maybe you'll decide that you just like the cash flow that’s coming in from the property and want to hold onto it – that’s totally fine too! The key in all of this is to make it as systematic and unemotional as possible. The numbers will tell you where the good deals are. Conor Flaherty has experienced every aspect of the foreclosure and rental business for single-family homes. He was VP of Acquisitions at Silver Bay Realty Trust and has flipped over 100 homes. Conor has a blog called Wall Street Slum Lord and he is currently working on publishing his first novel. You said it right. A good real estate agent or broker can help you to find the best. I brought an apartment from Qatar last year from a real estate agent. Their services was excellent. Good to hear about your experience Ernestine – thanks for sharing! Can you provide some tips to buy an apartment building that is off-market and chances for getting a better deal. Thanks for sharing the process used to flip, or re-position, an apartment building. Is it true that a property’s cap rate can also be an indicator of risk? You said that higher the cap rate means higher the risk. I think things are different in different areas. Maybe this is written about NY, in Chicago you certainly don’t need to hire a lawyer to raise the rents. You might want to use a Realtor, leasing agent or property manager who will help you to figure out how much rent should be and be able to bring in renters if any current tenants bail when rent is raised. Also in Chicago rent CANNOT be raised during a lease! Do yourself a favor, hire a professional, at least get advice from the Realtor you use to buy the property. Thank you for sharing , Great post ! What’s the process when buying a vacant apartment building that needs a complete renovation, this certain property has been vacant for over a year. Does this bring up any challenges or is it actually a better scenario?